This week, New York society stepped out for the Park Avenue event "Save Venice," a super-fancy masquerade ball to raise money for the restoration and preservation of Venetian artworks. The difference between big-time parties like these and the Academy Awards is that socialites actually pay for and own their couture. These guys on the left with Michelle Harper (whose mask was created by Björk's makeup artist, FYI) are Peter and Harry Brant, model Stephanie Seymour's sons. Can you believe she has adult sons? To the right is Charlotte Ronson in a simpler netted mask. Purple-haired writer/artist Beatrix Ost [far left] is my favorite with her everything-but-the-kitchen-sink/Beale look. Although Susan Shin [far right] is a close second in an elaborate muumuu accompanied by white fur. The rest of the ladies, from second from the left: Anne Fitzpatrick Cucchiaro, Heather Georges, Kate Peck, and Pamela Ludwick. Some of the more elaborate masks were worn by Louis Corello, Donna De Cruz, and Christine Schwartzman's breasts. 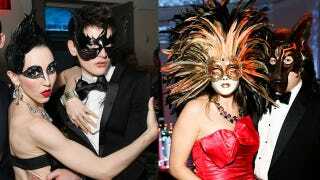 Coralie Charriol Paul, Cornelia Guest and Tinsley Mortimer weren't as married to the masked theme as other attendees. Full of skirt: Chiu-Ti Jansen, Alexandra Lebenthal, and Amanda Hearst. They'll see you in your nightmares.